We have just launched the dugouts from Kisangani. 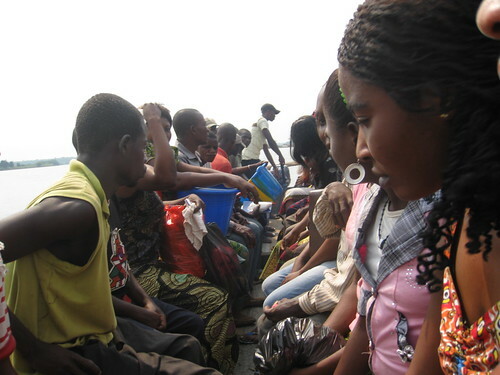 The 2011 trip took two weeks to stock: sacks of beans, sugar, salt and dry fish; pails, plastic cups and 28 barrels of fuel. The crews have to remember everything from sewing needles to spare bicycle spokes. 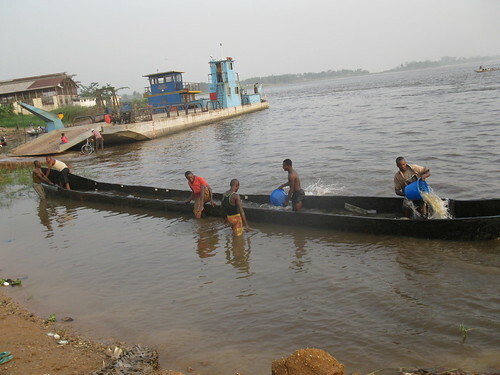 Most of the team cruised kisangani’s market and shops, but a group of three stayed close to the river. Our three pinaciers (helmsmen) had to get the dugouts in order. They bought one new one and patched up the two old ones. For the next couple weeks the teams will live in these dugouts – and for the next 6 months the dugouts will be essential for getting up and down our two main rivers, the Lomami and Lualaba, to reach different take-off points for monitoring hunting and following bonobos. The river routes to TL2: the Lomami to the west is winding, long and with many sandbars. It has had little development south of Opala; the Lualaba to the east is a near straight run between Ubundu and Kindu. 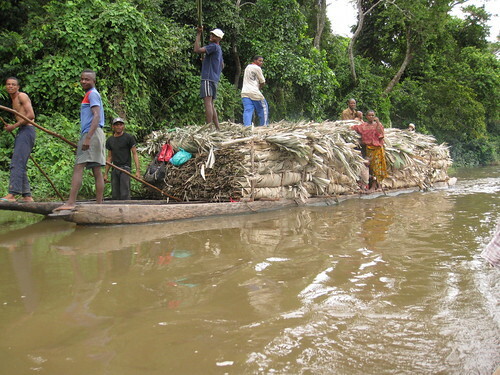 Between Ubundu and Kisangani, however, are rapids. Dugouts are probably the oldest form of transport in Congo and certainly the most conservative : dugouts are essentially the same as they were more than a hundred years ago. Dugout of the late 19th century. All those paddles made up for the lack of motor. 1. 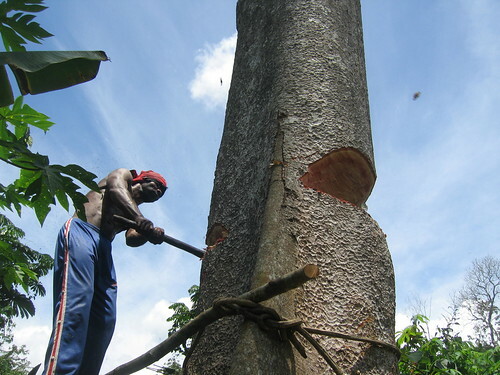 The best big dugouts are made from Boulu (local name) or Gossweilerodendron balsamiferum – in the same family as green beans and peas – growing to a heigth of 60 m (197 ft) and a diameter of 180 cm (71in). Other trees don’t last and/or don’t “behave” as well in the water. 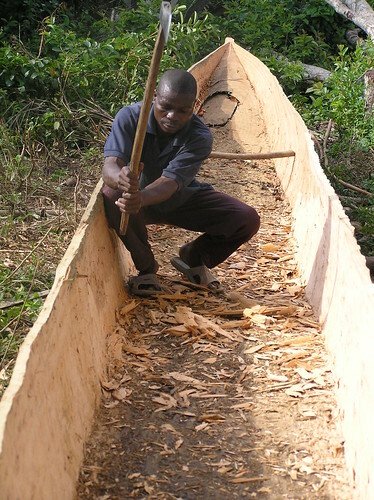 All three of our dugouts are made of Boulu and came from far downstream on the Congo river. The tree doesn’t grow in the TL2 area. In the TL2 provinces of Orientale and Maniema the giant dugouts are made of Khaya or Entandrophragma…but these are not quite the same as a Bolulu dugout. 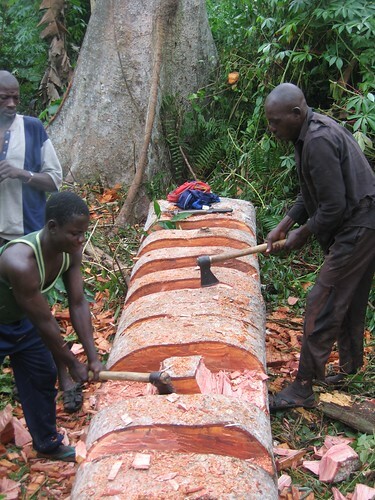 This dugout is being carved in Equateur Province where Boulu is most abundant. Just found out that Boulu is an Endangered timber species (on the IUCN Red List)…it would change the life of many if this species disappeared. This Khaya is being taken down to make us a dugout for crossing the Lomami at Katopa. The first stages of turning the Khaya into a dugout. 2. To repair a dugout that has begun to leak, tin, tar, forest leaves and small nails are needed. The tin is found as old, used bits of roofing – absolutely not the “new” steel roofing used now, but rather roofing with a real tin coat that does not rust. To find it you have to scour the market or plead for a sheet or two from the stocks of river sailors. 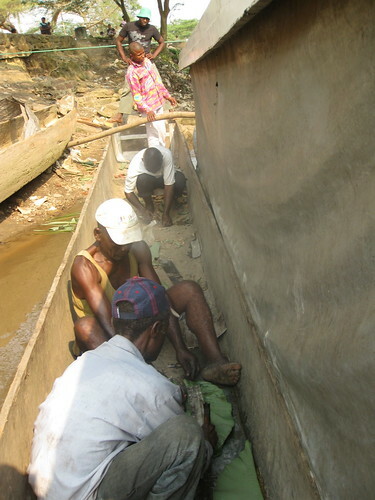 The repair team at work on our smallest pirogue in port in Kisangani. 3. 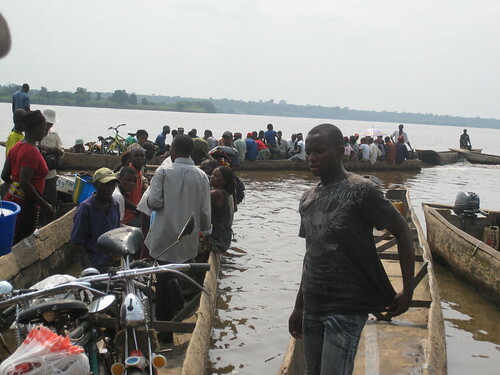 Every Congolese town on a river (and that is most Congolese towns west of the highlands) is full of dugouts ferrying people back and forth across the river. There are dugouts bringing in farm and forest produce and taking out manufactured goods. Inside the dugout ferry crossing between the right and left bank at Kisangani. 4. 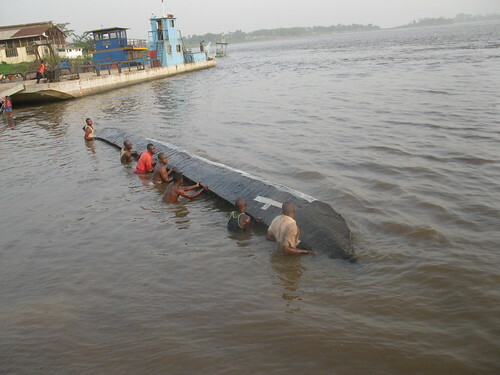 There are fewer motorized boats on Congo’s rivers now than during Colonial times but the dugouts are still flourishing (they can be paddled or poled); they are ever more important. Poling mugobo thatch up to Kindu – two dugouts in tandem. 5. 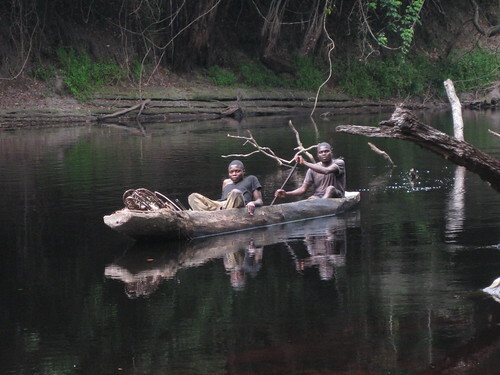 If you live on Congo’s rivers, a dugout is more critical than a car in America’s outer suburbs: fisherman, farmer, hunter…all depend on dugouts. 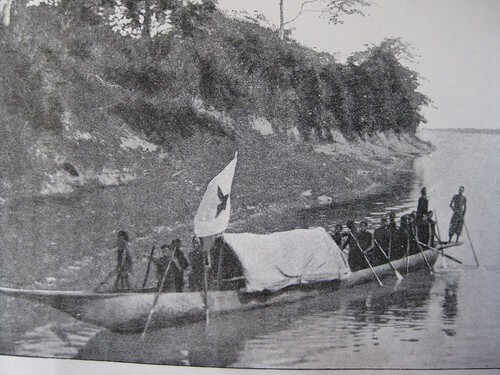 Hunter crossing the Kasuku river. 6. And dugouts are probably every bit as dangerous as any vehicle racing down American highways. These are rivers with currents and undertows. Last April while we were sitting on our porch in Kindu watching a storm come up, several hundred meters away a dugout ferry crossing students after school capsized. Over a hundred school children drowned. Just two weeks ago as we were repairing our dugout in Kisangani , a dugout got caught under the edge of a barge just upstream and flipped, several drowned. 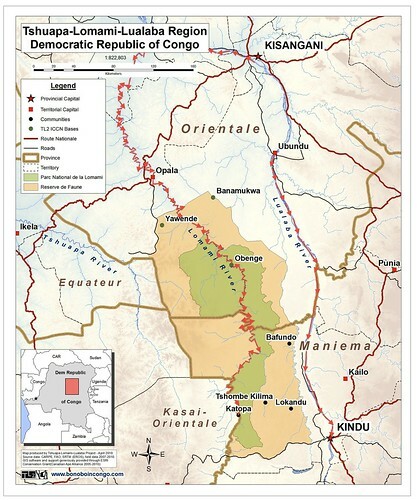 This entry was written by Terese Hart, posted on 2011-02-08 at 6:07 pm, filed under About the project, Kisangani. Bookmark the permalink. Follow any comments here with the RSS feed for this post. Post a comment or leave a trackback: Trackback URL. Great article! 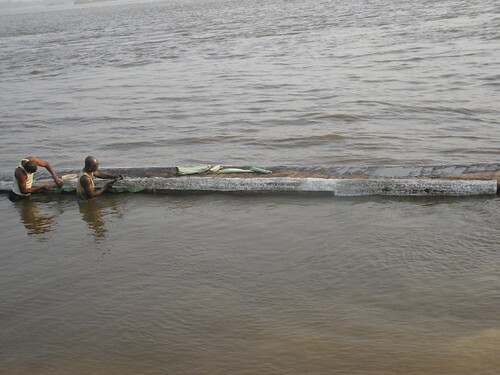 Any idea about the typical longevity of a Congo River pirogue? Also, how much do they cost? Our biggest dugout, made from Equateur’s Boulu, and bought right in Equateur cost 1000 USD. It would have cost more if we bought it from a middleman. We have already had it for three years and they tell me we should be able to get another three out of it….but some of that it seems is luck. Our smallest dugout cost 900 USD but we bought it closer to Kisangani — thus from a middleman.